Kate Burton plays David Giuntoli's aunt on Grimm. Since Burton's bald cap looks much smoother on tv, I assume they cleaned it up with CG. It is notoriously difficult to keep bald caps from buckling in the back. Have you heard about the new TV show “Grimm”? One of NBC’s latest additions to their primetime lineup. Something to compete against ABC’s fairy tale show, “Once Upon A Time” which I have not had to opportunity to see. I took the time to catch up on some episodes of the new show, which is loosely based on Grimm’s fairy tales, with a side of Law & Order. I am only two episodes in, but I am starting to like it and I am very interested in where the plot and special fx will go, later on in the season. JoJo Myers Proud is Head of the Makeup Department on “Grimm” and Barney Burman is the Creature Makeup Creator, both very experienced and creative makeup artist. This show is a mix of practical makeup effects and CG. I would love to talk to them about what it’s like to work on a set like that. Together, Proud & Burman posted this on the NBC website blog about doing makeup for the show. 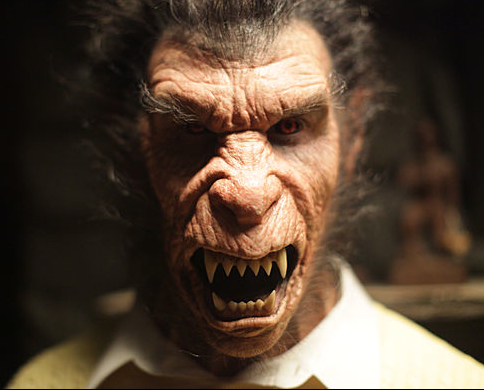 Great beauty & special makeup fx, mixed with a little CG, make Grimm interesting and fun to watch.